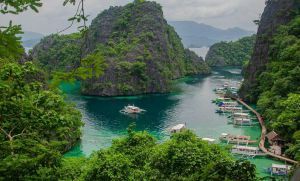 Located approximately three hours away from Cebu City is the simple and quiet town of Oslob. The town became the center of attention in the province of Cebu in recent years because of the sudden popularity of whale shark sighting. Although Oslob has always been the path of whale sharks heading to Sorsogon where they are also a source of attraction during the migration months, it’s only in recent memory that the town has capitalized on the presence of these sea creatures. Built in 1879, this is the oldest street in Oslob. It was named after the parish priest during the Spanish era, Father Jose Aragones. This road starts in front of the church and leads to the cuartel (barracks). This is known as the barracks or headquarters during the Spanish occupation in the Philippines. It’s now mostly a ruin, but you can still appreciate what remains of the structure. A fact about the barracks was that it was never completed because the arrival of the Americans halted the process. Coral stones were used in the construction of this structure. This is known as a watchtower. Oslob is a seaside town and baluartes were constructed along her coast to keep watch on raiders. One of the most accessible baluartes is the one in the Municipal Heritage Park. There are seven of these around Oslob. The one in the park was built around 1788. This is not a grand park in a sense, but it is still beautiful. It overlooks the sea and on a clear and bright day, you get lovely views of the water and of the mountains. It has several benches where you can just sit and contemplate. These structures were constructed in 1875 to protect the town from Moro raids. The walls give the complex a distinct feature thanks to its pyramid-shaped tips. 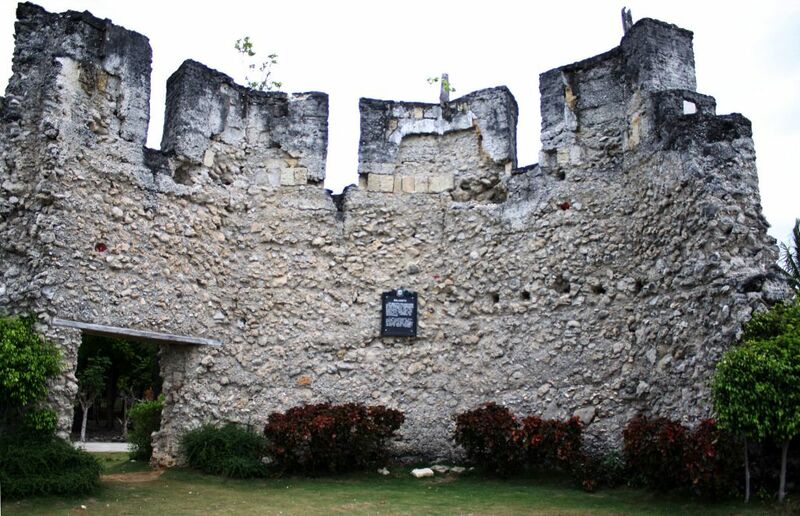 This is one of the oldest churches in Cebu that were remnants of the Spanish occupation. However, the church you will see today is a restored one as it has suffered from two fires in its history. On November 7, 1955, a fire destroyed the church and again on March 26, 2008. All of these sites are within walking distance from each other and are all located in Poblacion, Oslob. Some of the locals call this “kawasan” which shouldn’t be confused with Kawasan Falls in the town of Badian in the southwest of Cebu. It is also known as Toslob Falls by the locals. This is located in Barangay Tan-awan where the whale shark-watching activities are. You can hire a “habal-habal” to get to the falls. 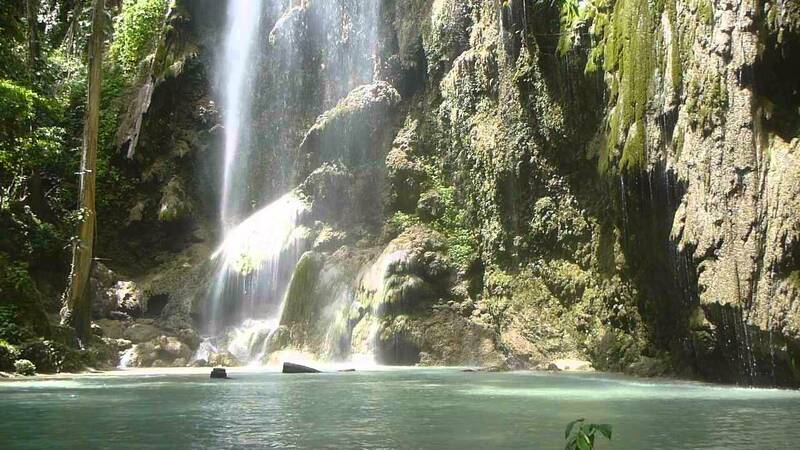 It’s a picturesque beauty hidden in the mountains of Barangay Tumalog. At one side, water drops from a very towering height while at the other side, water drips in multi-tiered levels. Located in Barangay Mainit, this is rich in sulfuric water and is said to be curative and can relieve exhaustion. 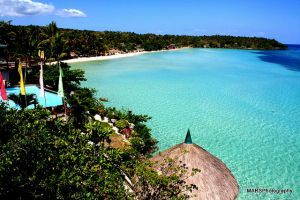 This is a private island resort which can be reached with Barangay Tan-awan, Oslob as the jump off point. From Tan-awan, you will board a boat which will take you to the island in 15 to 20 minutes. When you want peace and relaxation, this is one of the best places you can ask for. You’ll love the azure waters and the collection of flora and fauna on the island. The best way to reach Oslob is by boarding a bus at the South Bus Terminal in Cebu City. From there, the trip will last close to three hours. Tip: leave as early as you can (3-5 AM) so that you can get to enjoy lots of activities. This is especially true if you want to go whale shark-watching, visit the falls and go on a heritage tour in just one day. Whether it be historical sights or the beauty of nature, rest assured Oslob has got something to offer.